In a rather odd teaser for an upcoming Bill O’Reilly interview with co-host Hannah Storm on Wednesday’s CBS "Early Show," co-host Harry Smith remarked, "And looking for love in all the wrong places. Here's Bill O'Reilly in the studio this morning." What? 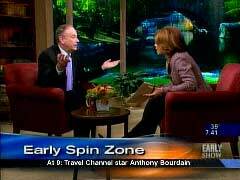 Who’s "love" is O’Reilly looking for and why is the "Early Show" the "wrong" place to find it? Smith certainly made no such comment when he welcomed the ultra left-wing Dennis Kucinich earlier on the program. For his part, O’Reilly had some odd responses when Storm asked about Hillary Clinton’s latest debate performance and charges of sexism against other Democratic candidates, "What do you make of Bill Clinton criticizing Hillary Clinton's Democratic rivals, saying that they were swift-boating her?" O’Reilly responded, "You see, I don't believe anything the press writes about Bill and Hillary Clinton at all...We tracked it yesterday, and we couldn't find any swift boat reference." Well, a Fox News article with Associated Press contributors quoted the former president: "We saw what happened the last seven years when we made decisions in elections based on trivial matter...When that scandalous Swift Boat ad was run against Senator Kerry." Later, Storm asked, "What about the gender card here?...She later went on and said politics was an all-boys club, her surrogates are crying sexism..." O’Reilly responded in similar fashion, "Well, she didn't say that. Her people said that...I couldn't find the sexism quote by her." Well Hillary’s people certainly have gone farther with those charges, but, "Clinton herself referred to the "all boys club of presidential politics" in a speech at Wellesley College Thursday," according to an Associated Press article from November 3, featured on FoxNews.com. Here's the deal, alright, Hillary Clinton had an opportunity at the debate to answer a very simple question -- 'do you support driver's licenses for illegal aliens?' Hillary Clinton chose not to answer the question, alright? So, Russert, the NBC guy, zoomed right in and she got hammered because we need presidential contenders to answer the questions...Because look -- enough with this nonsense. Whether Bill Clinton is mad that Barack Obama gave the husband -- the wife a dirty look, I don't care. I want to know if Hillary Clinton favors driver's licenses for illegals. Call me crazy. That's all I care about, yes or no, madam....But again, Hillary Clinton is the front-runner. Alright? They'd be stupid not to go after her. Barack Obama is -- has no chance unless Senator Clinton falls apart. None. He doesn't have a chance anyway. Alright, so Obama has to go after her. It's not sexism. O’Reilly is not crazy, Hillary should be challenged on the issues and should not be allowed by the media to hide behind the "gender card." O’REILLY: I am so angry about how children are being treated in America today. You know what the latest is? O'REILLY: Here's the latest. If you're a kid from a religious, conservative, traditional home, you go to school, you're called a geek, a moron, a nerd. STORM: Yeah, but hasn't it always been that way? STORM: You're saying this is something new? Storm’s belief that the mocking of "religious, conservative, traditional" kids in schools has "always been that way," is a little disconcerting. HANNAH STORM: You got a smile. . Hi, Bill. He's waking up. He's got a new book about kids and their rights. STORM: The 'Hannah Zone.' I love it. STORM: Ooo, You better be frightened. STORM: We're going to talk news of the day, including "Flubba." What's this all about? Right, Bill and Hill. O’REILLY: We'll let you know. You've got to stay tuned for that. STORM: Want to say that part? O’REILLY: This is "The Early Show" on CBS. Very early. STORM: The 'Hannah Zone,' the 'Hannah Zone,' I like it. HANNAH STORM: Bill O’Reilly has spun his no-spin outlook into an empire. His top-rated "O’Reilly Factor" is on cable and daily a radio talk show, a series of best-selling books. His latest book is called Kids Are Americans Too. And it debuted this weekend at number eight on The New York Times bestseller's list. Bill O’Reilly, good morning. BILL O’REILLY: Nice to see you, Hannah. STORM: Kids are invested in politics, as you know. I told my 10-year-old that the elections were yesterday and she said 'finally they're voting for president.' I said no, that is an entire year away. But there's a lot to talk about with the elections. What do you make of Bill Clinton criticizing Hillary Clinton's Democratic rivals, saying that they were swift-boating her? O’REILLY: You see, I don't believe anything the press writes about Bill and Hillary Clinton at all. O’REILLY: No, I think they make it up, you know. And I do this because they make stuff up about me. They make stuff up about any controversial figure. So, they're sitting around going what can we say about Bill Clinton? We tracked it yesterday, and we couldn't find any swift boat reference. STORM: So you're saying he never said it? O’REILLY: I don't know. I couldn't find it. I didn't report it. I couldn't find it. I had a segment last night on The Factor, I couldn't find it. STORM: What's Barack Obama's stance then? STORM: `Because he's criticizing Bill -- He's taking on Bill Clinton. O’REILLY: In the 'Hannah Zone,' we want to cut through the fog. O’REILLY: Here's the deal, alright, Hillary Clinton had an opportunity at the debate to answer a very simple question -- 'do you support driver's licenses for illegal aliens?' Hillary Clinton chose not to answer the question, alright? So, Russert, the NBC guy, zoomed right in and she got hammered because we need presidential contenders to answer the questions. STORM: Well, that would be something new, wouldn't it? O’REILLY: Well, then you're going to get hammered by me and everybody else and in the 'Hannah Zone' by you. O’REILLY: Because look -- enough with this nonsense. Whether Bill Clinton is mad that Barack Obama gave the husband -- the wife a dirty look, I don't care. I want to know if Hillary Clinton favors driver's licenses for illegals. Call me crazy. That's all I care about, yes or no, madam. STORM: What about the gender card here? O’REILLY: Well, she didn't say that. Her people said that. STORM: They cried sexism. She actually did say that. I believe that was a quote in a speech that she gave. O’REILLY: I couldn't find the sexism quote by her. STORM: You couldn't find that either. O’REILLY: And I'm trying to be fair and balanced here. If I can't find it, I'm not going to take it out of some dopey newspaper because they just make this stuff up. But again, Hillary Clinton is the front-runner. Alright? They'd be stupid not to go after her. Barack Obama is -- has no chance unless Senator Clinton falls apart. None. He doesn't have a chance anyway. Alright, so Obama has to go after her. It's not sexism. O’REILLY: It's about being president. O’REILLY: The mayor of New York? STORM: Yeah, the mayor of New York, right? STORM: Who may or may not jump into the presidential race. O’REILLY: He's not running. Hannah. STORM: And may, or may not have a billion dollars of his -- you're saying no way? O’REILLY: He's not running for president. He can't even get that truck, right over there, off the street. It's double parked. Somebody give that guy a ticket. O’REILLY: I'm going to let him run the country when he can't get that truck off the street? Come on. STORM: Let's talk about your book. O’REILLY: Not running for president. STORM: Alright, let's talk about your book. STORM: Kids' rights. What's the most important right a kid in this country has? O’REILLY: Kids Are Americans Too, you got to understand something here. I don't need to write these books. I have to stay up late to wright them. As you point out, I have a TV and radio show, alright. I don't need the money, alright. I am so angry about how children are being treated in America today. You know what the latest is? O’REILLY: Here's the latest. If you're a kid from a religious, conservative, traditional home, you go to school, you're called a geek, a moron, a nerd. O’REILLY: The pendulum shifts. It used to be the stoners were mocked. Now it's the straight kids are mocked. It's just a matter of our society. STORM: And why is that? So, who's being held up as the model of what a kid should be? O’REILLY: It's basically -- the cool kids now are the kids who are bad, the kids who are doing the, you know, we see it every day. STORM: Like the Britneys and Lindsays of the world? O’REILLY: Yeah, yeah, that kind of thing. But a kid, no matter who it is, shouldn't have to take that stuff. If you go to school and you're 14 or 15 years old, and somebody's calling you a nerd because you go to church, that's wrong. So, I wrote this book, Kids Are Americans Too, for parents and grandparents to put in the hand of their child and say look, you're an American. You have rights. You don't somebody can't browbeat you. Somebody can't lay hands on you. Know what your rights are and what they aren't, because they're different from the rights of Hannah Storm and Bill O’Reilly. That's what's in the book. STORM: You can be a free thinker, stand up for yourself. O’REILLY: I -- that is what we all should be teaching our children. STORM: Alright, Bill O’Reilly, thanks. STORM: Good to be with you this morning and I hear that truck, the horn out there. O’REILLY: Get that guy out of there, right over there.